This is the first Odyssey sampler (4 Track) just released. Who in UK is willing to ship a copy across the pond to Florida??? I thought I'd help to populate this thread with some scanned images of a few of my "Promo CDs". In this first post, I have included images of "Promo CDs" for 'Pure' which I have acquired. Here are the front covers of a 5 track "Mini CD" and a 2 track "Promo CD". (Hayley signed the 2 track Demo CD for me at the Manchester Bridgewater Hall in 2004). Here are images of the 5 track "Mini CD" and the 2 track "Promo CD". Here is an enlarged image of the reverse of the cover for the 5 track "Mini CD". It's ironic, since the new 2004 "Special Edition" of 'Pure' was released on 15th November 2004. That night I saw Hayley perform at the Usher Hall in Edinburgh (as did Roger!) I bought a copy of the new CD in the foyer after the Concert. Hayley performed a stunning duet of 'Hine e Hine' with supporting artist, Mario Frangoulis at the end of her set that night. This 'Odyssey' "Promo CD" includes a stunning 16 tracks! Here is a 4 track 'Odyssey' "Promo CD"
The scans by you and Steve of these album promos are especially interesting to me as I don't have any of them! Thanks for the scans Andrew, you have a good collection too! I hear you have a copy of the new Odyssey promotional CD, what do you think of the new tracks? Hi Steve... my "Promo" buddy!!! Just imagine we worked together within a company. We'd be forever writing glowing reports for one another- all for the sake of gaining promotion! I so look forward to hearing Hayley sing this piece live. Hayley really brings out the elegance of this piece. My favorite is 'The Water is Wide' I think it suits Hayley's voice perfectly, and dare I say it on this board, but the only other version I have heard is Charlotte Church's version. I am off to listen to it again with another glass of Whiskey. I hope we get some other posts of these promotional Cd's there must be some we do not have? at least now we know what to get Dave for Christmas! I have quite a large collection of Hayley promo CD's, below is a list of those that I don't think have been referred to before. No. LC00071 – German Volvic Promotion in card sleeve. No. LC00171/4756719 – German Volvic Christmas Promo in card sleeve. That was Sat 21 Jan 2007. 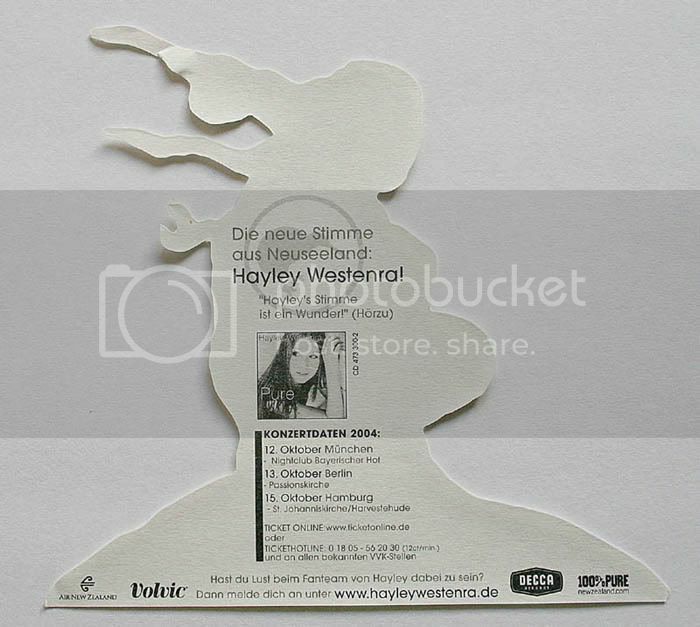 As promised, below are the images of the German Volvic Christmas promo CD. From the cover it would suggest these were given away instore for the recipient to pass on as a gift - nice idea don't you think. She could sign in the little box at the bottom and it would look like a gift from her!